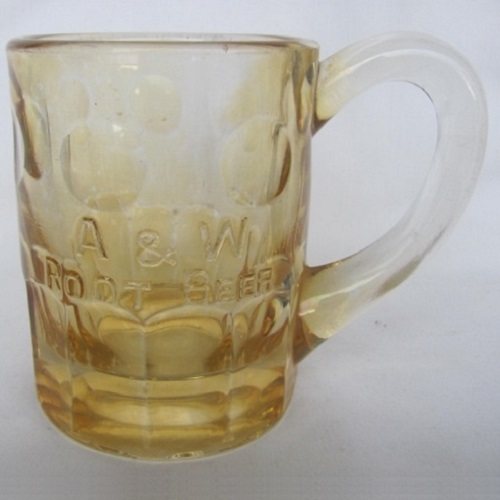 Pattern Description: Mug with "A & W Root Beer" embossed on the side. A & W Root Beer was first available in 1919. The A & W logo was first used on embossed mugs in 1921. According to Root Beer Float (a newsletter for collectors of root beer memorablia), the first mugs were belived to be made by Indiana Glass. These were their #1504, 10 oz. mug and 3 1/2 oz.”Baby Mug”. Mugs were also made by US Glass (1940 to 1946), Hazel Atlas (1925 to 1960 – usually having the HA trademark embossed on the bottom), and Indiana Glass (from 1919).